29.04.2019, 16:19 za 6 dni 14 godz. 20 min 15 sek. 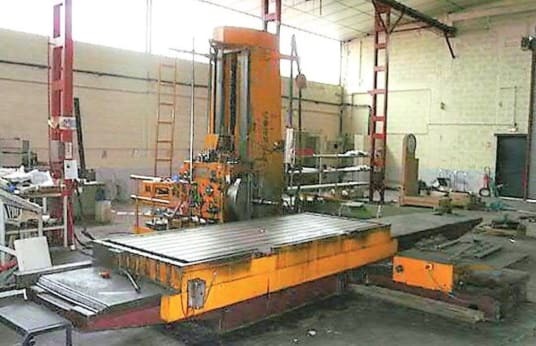 Horizontal boring machine, Longitudinal stroke of the column: 1300mm - Cross bench: YES - Spindle stroke without reworking: 1000mm - Spindle cone: CM 7 - Diameter of the surface plate: 800mm - Stroke of the surface plate carriage: U: 320mm - Table surface: 3200x1300mm - Maximum surface diameter: 1000mm - Variable spindle speed: 5.6 to 800 rpm - Rotational speed of the table to be surfaced: 5.6 to 160 rpm - Automatic feed rate: 18 - Automatic spindle feed rate: 0.04 to 2.5mm/rpm - Number of table feed rates: 18 - Table feed rates: 0.20 to 12.5mm/rpm - Transverse table feed rate: 0 to 2m/min - Spindle motor: 15/18cv - Table motor: 4.5hp, Stock number 95595. ATTENTION: Machine loaded by overhead crane.